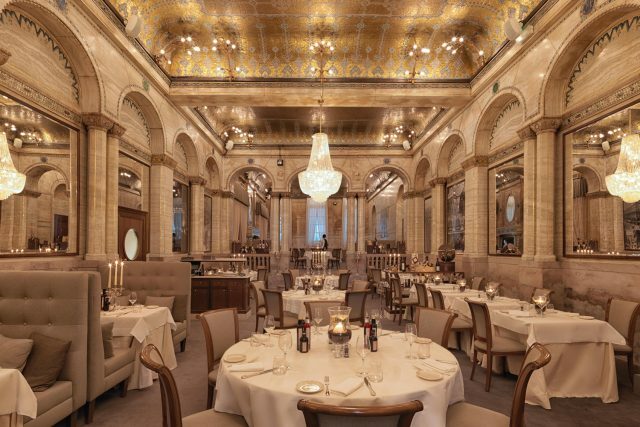 Housed in a Grade II listed building dating back to 1873, Savini at the Criterion in Piccadilly boasts some of the most opulent interiors in London, with its Corinthian columns, ornamental tile work, elegant arches, shimmering chandeliers and glittering gold neo-Byzantine ceiling made with gold leaf. The restaurant was built by architect Thomas Verity in the late 19th century in the Neo-Byzantine style. The original space boasted a ballroom on the third floor and a theatre in the basement. Sir Arthur Conan Doyle even used it as the setting for Dr Watson learning of his new roommate, one Sherlock Holmes, while dining with a friend.